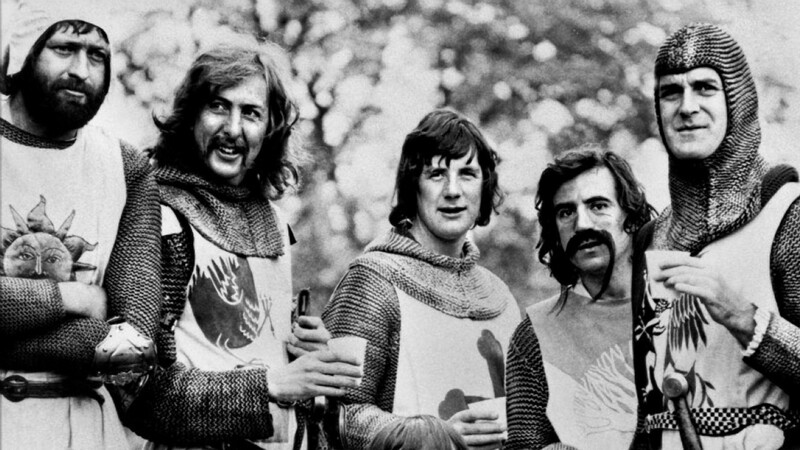 The famed comedy troupe will be on-hand at the 2015 Tribeca Film Festival to celebrate the 40th anniversary of Monty Python and the Holy Grail and the international premiere of the doc, Monty Python – Meaning of Live. Forget Camelot. It’s a silly place. New York City and the 2015 Tribeca Film Festival, are where you need to be to share in the festivities surrounding the 40th anniversary screening of Monty Python and the Holy Grail at the Beacon Theater on Friday, April 24. Monty Python members John Cleese, Terry Gilliam, Eric Idle, Terry Jones, and Michael Palin will take part in the celebration, and related events will include the international premiere of the doc, Monty Python –The Meaning of Live. In fact, New Yorkers will be among the first to see Roger Graef and James Rogan’s feature-length documentary that offers unprecedented access into the personalities, relationships and history that made the Pythons into a global phenomenon. The film allows the comedic geniuses themselves to reveal the impetus of some of their most well-known pieces and provide an in-depth history of Python’s stage work as they prepare for their final live show at The O2 in London. Michael Palin performs this classic number as a lumberjack with a surprising fetish (which we won’t reveal). The real kicker is the group of rugged Canadian Mounties who must repeat the verses, only to grow more and more reluctant as the song goes on. Physical comedy extraordinaire John Cleese shows off his skills in this sketch about a civil servant who works in the Ministry of Silly Walks, desperate for a grant to develop a peculiar gait. Wait for the secretary that must carry in a tray of tea while silly walking. Spoiler: everyone leaves thirsty. You’ll never think of Cathy and her beloved Heathcliff the same way after watching these two tormented lovers wave flags frantically back and forth at each other to express their feelings. Keep watching as the troupe tackles more unconventional adaptations with Julius Caesar On An Aldis Lamp and Gun Fight At O.K Coral In Morse Code. When you walk outside your door, we bet you don’t ever ponder the devastating consequences of running into an attacker armed with a piece of fruit. This sketch features an intense instructor (played by John Cheese) who finds the prospect of a pineapple more terrifying than a handgun. His students remain skeptical. Eric Idle plays a news anchor who narrates the dastardly deeds of a group of elderly women who threaten the neighborhood. You can’t help but laugh as these geriatric terrors tip over phone booths, write obscene graffiti (‘Make Tea Not War’) and cause mayhem at the 2PM matinees.